When you design a yacht to deal with heavy weather, the process is made difficult by a lack of real world experience in truly dangerous conditions. But occasionally events transpire from which you can learn something. One of those is depicted above in the photo sent in by Peter Watson, the owner of FPB 64-6 Grey Wolf. Markers are laid down that can be dissected and, when understood, move the design process a bit further along. One of those events transpired recently as FPB 64-6 Grey Wolf, Peter Watson Master, was approaching the Azores in the Eastern Atlantic. Grey Wolf found herself in an unforecast strong gale. Before we get into this situation in detail, let’s spend a minute discussing heavy weather tactics in general. It is not unusual to want to run off with a storm, particularly if you are going the same way, or you have a storm center from which you are trying to move away. This is often the only course open when maneuvering away from a tropical storm system. In both power and sail steering, characteristics are going to determine how long you can run, and when you have to stop, turn around, and jog (under power) or heave to (under sail) heading into the wind and waves. Steering control itself is a function of rudder size relative to the load, hull balance, bow shape and if or when the bow begins to lock in. The deeper the forefoot is immersed, the more difficult will be the job of the rudder. As long as control is maintained, faster is usually safer and more comfortable. Boat speed reduces overtaking wave impact, lets fewer waves catch you, and provides more lift for rudder(s) to generate steering force. When the hull is being designed, if you are concerned with this subject, there is an inevitable conflict between upwind comfort and downwind control. The most comfortable upwind shape is narrow and deep. The best steering bow is wider and less immersed. There are no computer programs to make the decision, tank testing is of marginal value, in the end you go on gut, your own experience, and the reports of others. In our own case there are several seminal downwind passages that have helped us formulate our ideas on this subject. One was an extreme northeaster blowing against the Gulf Stream with extreme breaking seas aboard the 62-foot cutter Intemezzo II. 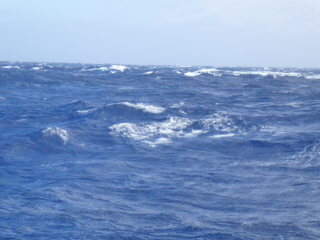 Another was a 50+ knot compression gale in the south Pacific aboard the 78-foot ketch Beowulf. The FPB 83 Wind Horse experienced just one real gale, that caught us between Greenland and Ireland, other than the 35-40 knots of wind on our first passage to Fiji from New Zealand, and this we went looking for. With the FPB 64s, we have had glimpses of how the design tradeoffs have worked downwind, but nothing we’d consider a real test, until now. What we are looking for is if and/or when the yacht runs out of steering control. With Wind Horse we never came close to running out of rudder. With the FPB 64 Peter Watson and Grey Wolf have moved the marker another notch. You are looking at a remarkable number, sent to us from Grey Wolf after they were secure alongside in Horta. 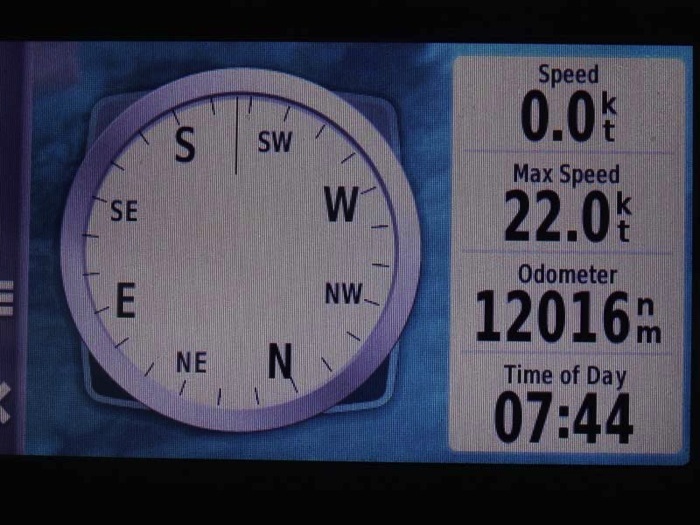 This is the maximum speed attained on the GPS when they were surfing off ahead of their force 8/9 gale. Twenty-two knots represents a speed length ratio of 2.7. Most “experts”will tell you that this number is impossible on non-planing hulls, and the round bilged FPB 64 is certainly not a planing hull! Grey Wolf was working her way through an under-forecast gale at 37 degrees 42.2 N 32 degrees 31.8 W. Waves were 3.5 -4m, fast moving, with long, mature faces. Wind speed was in the 28 to 40+ knot range, barometer 1015, and the engine turning 1775 RPM. The autopilot was in aggressive mode with minimum dead band/sea state and increased rudder gain. Peter Watson reports that they were in total control and at no time felt like they were close to the edge. At some point the FPB 64 is going to run out of control and need to stop, turn around, and jog into the seas. But that point has been pushed back. This entry was posted on Friday, July 11th, 2014 at 7:49 am and is filed under Cruiser's Tech Talk. Both comments and pings are currently closed. Great data. Very interesting. Thanks for sharing as always. I’m curious about the fin stabilizers in these sea states. Obviously they work well at higher speeds, but I imagine forces could overwhelm the engineering eventually. So far so good—I remember reading that they are oversized. Curious what thoughts you’ve given to failure and heavy weather. When thinking of typicall “trawler yachts” and paravanes in heavy weather I can help but remember that scene in The Perfect Srorm when the 100 lb steel fish is flying around and smacks into the bridge. I weathered one tropical storm on a Navy frigate with stabilizers and we found them to be of little value heavy seas. We were heading into 20ft seas and tried them on and off. No difference. Didn’t have the opportunity to try running off. In our own experience, and as far as we have heard with our FPB 64 owners, nobody has yet run out of stabilizer force, at least not for more than a single wave. As to the use of paravanes or fish, we came to the conclusion on Wind Horse that if the fin stabs failed, we’d just carry on without anything, rather than get into handling the paravances and the risk this entails on a lager yacht that does not use them all the time. Although the FPB family is out cruising right now, if any of them are catching up on the internet and read this perhaps they will add their own experience. Have you ever thought of using stern water ballast to trim the ship? So, if heading upwind, no stern water ballast, hull is trimmed bow down. Heading downwind, stern ballast is used, hull is trimmed bow up and maybe even out of the water. This would enable you to design in a reasonably immersed bow which could be trimmed up when required to avoid broaching. Perhaps bow water ballast could also be used to trim the ship as necessary. Weight in the ends will change the pitching response. This could be a good thing or a bad thing. Bow and stern ballast could be a way of managing pitching response of the ship. We have a very substantial amount of trim available between fuel and water tanks, 7000 gallons! Normal volume would be 4000 gallons, so there is lots of trim range built in. The other use of stern water ballast, other than hull trim and pitching management, could be using it as a brake in fast surfing conditions. By ballasting the stern, the stern “chine” will dig deeper into the water and act as a brake, slowing the boat down. Does this make sense? Stern down braking would not be effective on these very slippery hulls. We have yet to encounter situations where the stabilizers lost their effectiveness. As you point out, it can happen for a single wave and generally a big sneaker at that but the recovery time is very quick. Not sure what we would do if we lost the stabilizers but I would be concerned about trying to deploy the fish in difficult conditions without a lot more practice. My thought would be to jog into it (or with it) until things moderated and then consider using the fish. Do the stabilizers tend to interfere with steering in following seas? Is there a particular setting that might inhibit any possible interference? We have not had a problem with a steering input from the stabilzers. However, they are carefully placed to avoid this issue, and if their force is input at the wrong position it can cause difficulties with the helm. Steve; I am wondering — and have been for a long time [even asked Don about it] — what is the dynamic failure mode of the fins? In other words, where do they position themselves in the event that they become ineffective? Is it the same as the NAIAD typical where they go to 0.0° at high speeds so you don’t get lift unless forces act on the hull and the resultant angle of attack changes? Or, do they keep trying to fight the condition and go to full deflection? Not sure this is discussed in their literature anywhere, but I am sure that you and Don discussed it once or twice. We’ve tested the fins with hydraulics open. They do not center. The shaft is too close to the CL. If they stall the control keeps trying to right the boat, so the fins go to max AOA. It has been our experience, and reinforced in spades recently there are two effective ways to combat serious corkscrewing in large following seas Grey Wolf encountered and Steve mentioned. The first is to increase speed to get more water flow along the keel and prop wash to the rudder. Its sorta like the difference riding a bicycle in soft sand slow or faster. The second is to dial back the stabilizers. In the bout last week with large following seas on the stern quarter, we dialed back the stabilizers to near center. The combination of increased speed with more directional control and dialing back the stabilizers kept us moving on course and not have to round up and hold station. We agree with Scott on boat speed. As long as you have steering control faster helps rudder authority. The contribution (or not) of the stabilizers is a function of their position relative to the center of bouyancy of the hull. On, or slightly aft of the LCB and they will have little tendency to steer. As they move away from the LCB, in patriculare forward of it, the stabilizer fins begin to develope a steering couple and impact directional control. We tend to put our stab fins a touch aft of the LCB to be sure they do not develop a directional input.